Somerset House is to present British artist Hannah Perry’s major body of new work in her first solo exhibition in the UK since 2015. 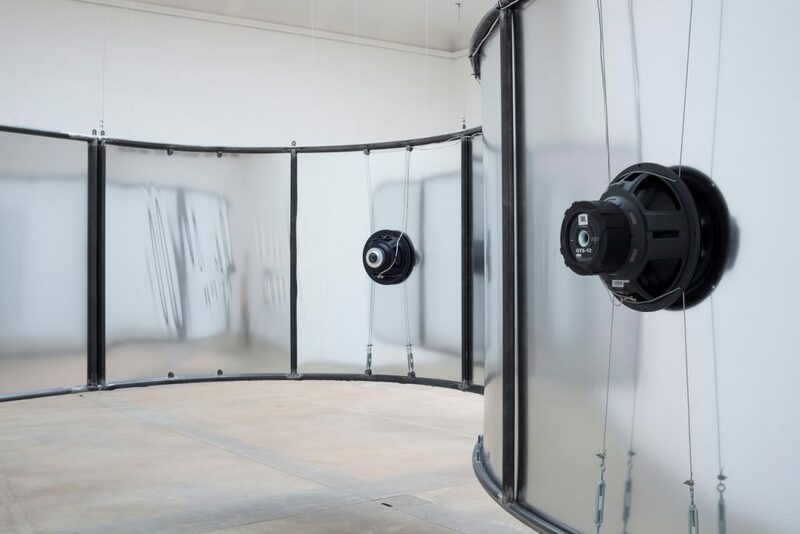 Perry who works mainly in installation, sculpture, print and video uses a network of personal references to continuously generate and manipulate videos, sounds, images and objects, exploring intimate memory in a hyper-technological society. Ahead of the highly anticipated exhibition, Huma Kabakci managed to catch some time with Hannah Perry. HK: The exhibition titled Gush taking place between 3rd October – 4th November at Somerset House is your first extensive UK solo show since 2015. 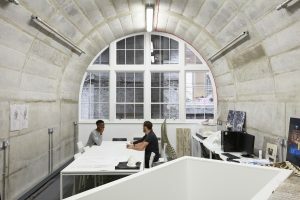 Could you please tell me more about the exhibition planning and making process and how the decision of exhibiting your diverse body of work at Somerset House came about? HP: Over the past years I have been working mainly on international shows. After moving between L.A, Montreal, Berlin and New York, I decided to come back to London and I have been a Somerset House studio resident since. My current projects have expanded on my interest to unravel the gendered and class-based parameters that code our lives. For the past 2 years, I have been, rehearsing, writing, editing, with various new groups of collaborators, all of which has been greatly facilitated by the curatorial team at Somerset House. HK: Gushexplores mental and emotional health in our current ¨contemporary¨ hyper-networked society. I have noted for example several peer-reviewed psychological studies have linked depression to cyber-bullying. How did the concept and title of the exhibition develop? HP:In January 2016, my friend and long-term collaborator took his own life. This show is a negotiation with that loss. Understanding the emotional space that compelled him to make that decision and as a knock-on effect, how this impacted those of us left behind. I wanted to take on a new body of research into loss, grief, delusions and trauma. 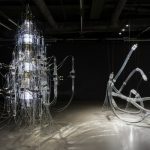 In a way, the exhibition title describes this burst, an overwhelming surge of emotions and its liquid capacity to infiltrate and take over our bodies. The works in Gush definitely take on bodily properties; shivering, vibrating, colliding and twisting around the exhibition space. The works look at the ways in which we navigate our relationship to this hyper-networked society through rupture and trauma. It’s a negotiation of 2 parts, on the one had suicide an earth-shatteringly extreme situation, a specific trauma with no answers, no explanations. And on the other hand, how loss is comparatively reminiscent to heartbreak, that listless, lifeless lumbering feeling in which you wake leaden after a row with your partner. 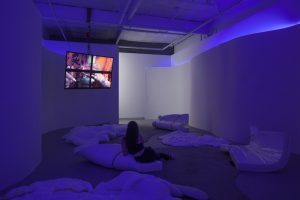 HK: After exhibiting Rage Fluidsat Künstlerhaus¨Halle für Kunst Medien for the first time, how do you visualise it in the context of Somerset House? Is site-specificity and responsiveness something that is significant to your large scale audio-sculptural works? 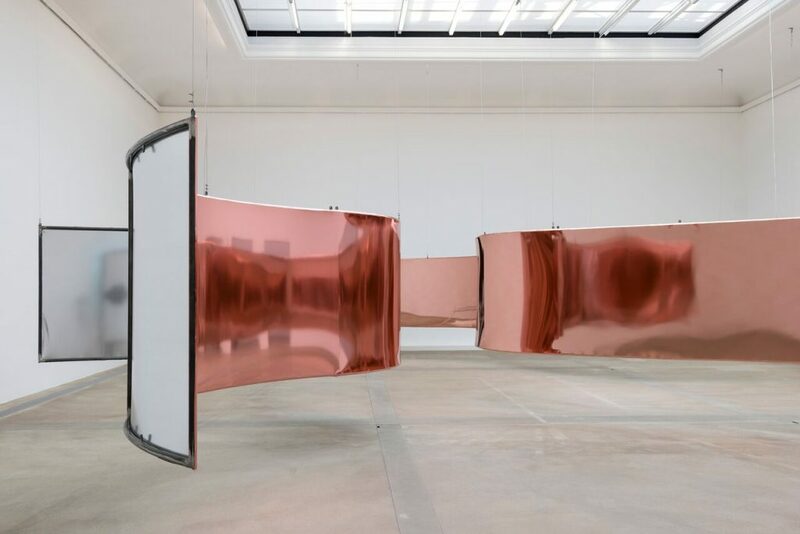 The sculptural work also consists of stretched car body wrap and subwoofer speakers, why did you choose these materials specifically in your installation? HP: For the Somerset House show, we will present an adapted version of Rage Fluids. In this particular context, the wobbling structure will crisscross in several rooms of the 16th-century building. This will enable visitors to have a much closer, almost visceral, encounter with the piece. Rage fluids is the largest iteration of a series of sound-based works I have worked on for the past several years. I am interested in the analogy of the car to the body, spoilers, grills body contours and modifications, and the idea of the car crash to represent impact in relation to trauma and psychosis. There is a line in the scrips, how the two can be understood as the clash and collision of two elements. Suspension, shock and absorbers. 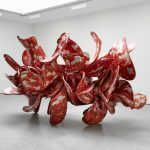 HK: Can you talk a bit about the new sculptures that will be presented at the exhibition? HP: I am making some new hydraulic sculptures. They are similar to the bent metal wall relief works that I was making a few years ago. This time they will be off the wall and freestanding side by side, or facing each other. They will have 4 motion simulator hydraulic pistons attached to the back of each side of them and we are working with a computer programmer to choreograph the movement of the two sculptures. The will be programmed to, at point’s dance sensitivity and softly in synergy together in perfect timing and in other moments will retract and crash together, scratching and destroying each other’s perfect chrome finished over time. I liked the idea of using movement or dance with the metal forms, 2 parts that in moment working in perfect harmony, with beauty and tension and in other parts crash together and destroy one another. The finish will begin as a perfect chrome metallic colouring that between them will glow. And overtime doesn’t, damage and chip away at each other. This sculpture will also have a sound element like the other sculptural works. The sound of mechanical pistons undulating rhythmically and then also the sound of impact, crashing of metal. HK: The special night opening of Gush will follow a new commissioned performance on 5 October. Without giving spoilers can you explain how the performance responds to the exhibition concept and the rest of the body of work? Or is it a choreography that has been developed as an outcome of the exhibition? HP: I have been developing scripts with a group of teenagers from South London. Fragments of thoughts and writings: mine, my friend’s and the young people . Along with the monologue, I am working with London Contemporary Orchestra and music producer called Coby Sey to compose a full score for the performance piece. We are also working with fashion brand HYDRA and also Nike for the costume. Just like the script and music, the performance is centred on bodies’ endurance capabilities, struggles, dark humour, rhythms and repetitions. HK: Central to the exhibition is an immersive film, created using a custom rigged 360° camera built by yourself. Is it the first time it will be exhibited? What is the 360° rigged camera supposed to give a sense of? HP:Yes, this is the first time that this version of the 360 film will be exhibited. My aim with this work is to convey a sense of proximity and juxtaposition of different subject positions, to ultimately destabilise these positions. HK: Is feminism and gender identity a recurring theme in your body of work? From the already existing images, how do you generate and manipulate these materials? HP: Much of my previous work is looking into how feelings such as obsession, despair and distraction are often categorised as irrelevant or self-indulgent when voiced by women. I definitely understand these issues from a feminist and gender identity perspective. I work with a wide variety of sources, such as psychotherapy papers, narrative writing, secretly recorded sessions with my therapist, magazine advertising, Instagram images, and memes. All these sources co-mingle into abstract assemblages that can take the form of paintings, videos, installations or performances. Gush is open from 3rd of October to 4th November 2018 For further information click here. Huma Kabakci (b. in 1990, London, UK) graduated from BA Advertising & Marketing at London College of Communication in 2011, and later on graduated from her MA in Curating Contemporary Art at Royal College of Art, London. She worked and interned in various galleries, museums and auction houses, both in the UK and Turkey, including Sotheby’s New Bond Street (Contemporary Art Sales department), The Albion Gallery (London), Pera Museum (Turkey), as well as three major collection exhibitions she worked on in museums during the 2010 Ruhr & Pecs Capital of Culture project. 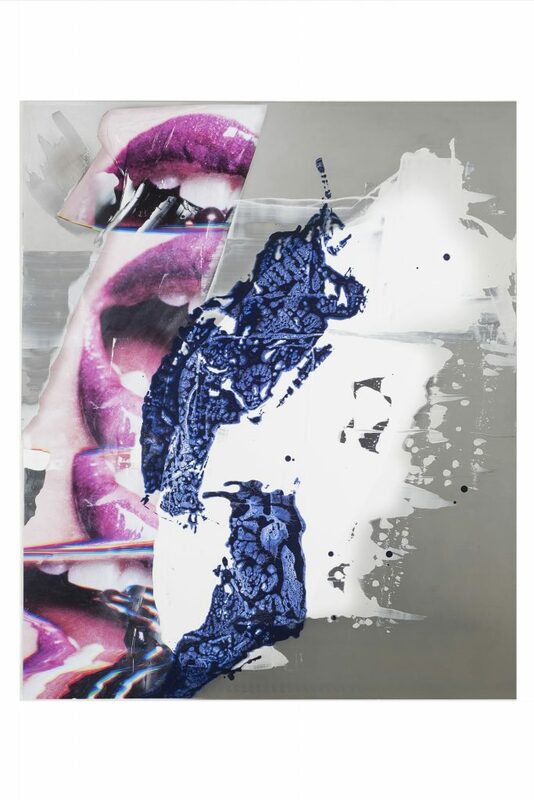 Huma’s recent curatorial projects include; Adventitious Encounters group exhibition (9-22 March 2018) with 20 international emerging and established artists which she co-curated and organised as Open Space Contemporary Founder and Ladies’ Paradise group exhibition (22 February- 12 April 2018) taking place at Grace Belgravia with four emerging female artists including Merve ? ?eri, Clementine Keith-Roach, Güne? Terkol and Sofia Stevi. Over the years, she has gained excellent knowledge in Turkish, Middle Eastern Contemporary Art and Emerging Contemporary Art in London and her curatorial interest lies in subjects such as; diaspora, cultural identity, gender, memory and the body. This entry was posted in INTERVIEWS and tagged Hannah Perry, Somerset House Studios. Bookmark the permalink.